I was inspired recently by a blogger whose blog is called No Recipes today. ” My philosophy on cooking is that it’s 50% technique, 40% inspiration and 10% ingredients”, a quote from No Recipe’s blog master, Marc Matsumoto. I haven’t actually had an opportunity to make any of Marc’s dishes, but in a way that is the point. His philosophy is one that I’ve been trying to grapple with more and more over the years. Personally a surprisingly difficult process. I’m a little addicted to cookbooks and I more often than not follow recipes and remain extremely envious of those creative and brave people like Marc who just ‘do’. Well, today I decided to make lunch without thinking. It worked for me, maybe this recipe won’t sit well with everybody, but darn it, I thought it was good. My main ingredient was ground beef (86%) that was about to get funky, and I was really hungry so I didn’t want to spend much time in the kitchen reinventing the wheel; burger time. I had mushrooms and chevre that needed using and spinach in the garden – although I would have preferred arugula. I had also given the chickens the last of the hamburger buns, so the only thing bread-y left was english muffin. My Knife and Fork Burger is born. Preheat a well seasoned cast iron skillet over medium high heat. Form a patty with the ground beef and salt and (lots of) pepper both sides. Toast the english muffin. Heat 1 tablespoon of the oil and butter in the pan. Once the butter is melted add your patty and cover with a lid (preferably glass). Once browned, flip and brown the other side. Cook the patty until desired doneness. Remove the patty and cover loosely with foil. Add the chopped mushrooms to the pan, you may need to reduce the heat a bit. Once the mushrooms are browned, add the spinach or arugula until wilted. Add salt and pepper and the remaining butter. Lightly butter the toasted muffin and top loosely with spinach and mushrooms. Sprinkle the chevre on the mushroom mixture and top with the cooked patty. Drizzle remaining olive oil over the burger. This entry was posted in lunch, recipes and tagged burger, hamburger, party by MixedSoup. Bookmark the permalink. This look amazing! I hope his food is 100% ingredients though! Photo is great too. Ha! Thanks Frugalfeeding! Your recipes look very tasty. I’m oddly partial to the rocket and poached egg dish. I think I’m going through an egg phase of late. I like having knife-and-fork burgers at home, and sometimes ‘no recipes’ is the way to go! 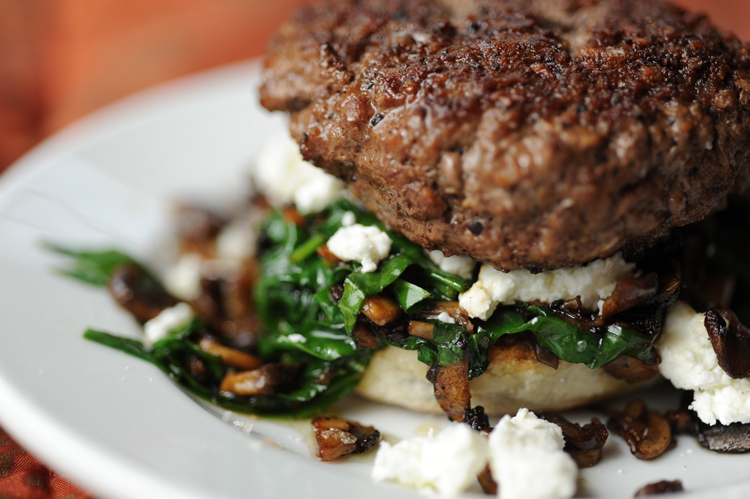 I love chevre, and imagine this burger tastes awesome!